Categories: filming, Market O, Photos, translation | Tags: filming, Go Yoon, hongdae, Lee Seung Gi, Lizzy, Moon Chae Won, movie, photo, Today's Love | Permalink. 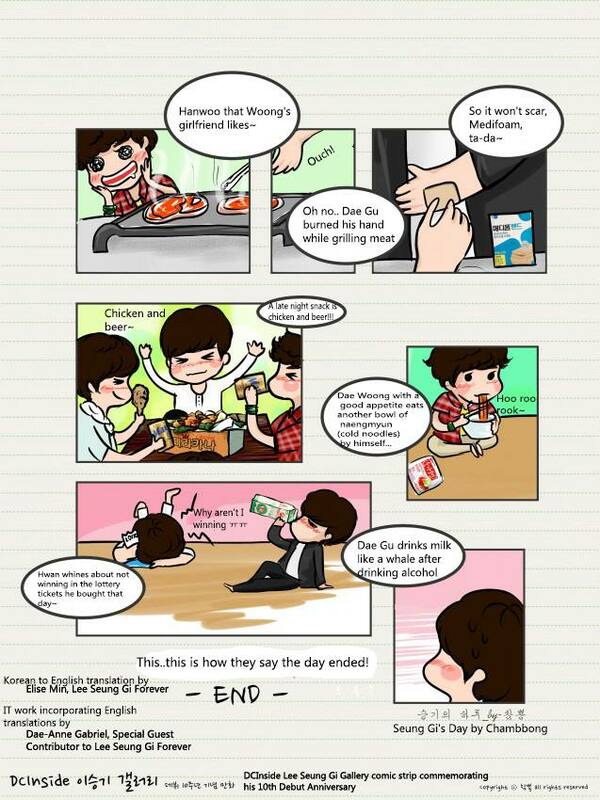 Special thanks to Dae-Anne Gabriel for her fabulous IT work which made this 10th Debut Anniversary comic by Chambbong on dclsg easy to read. 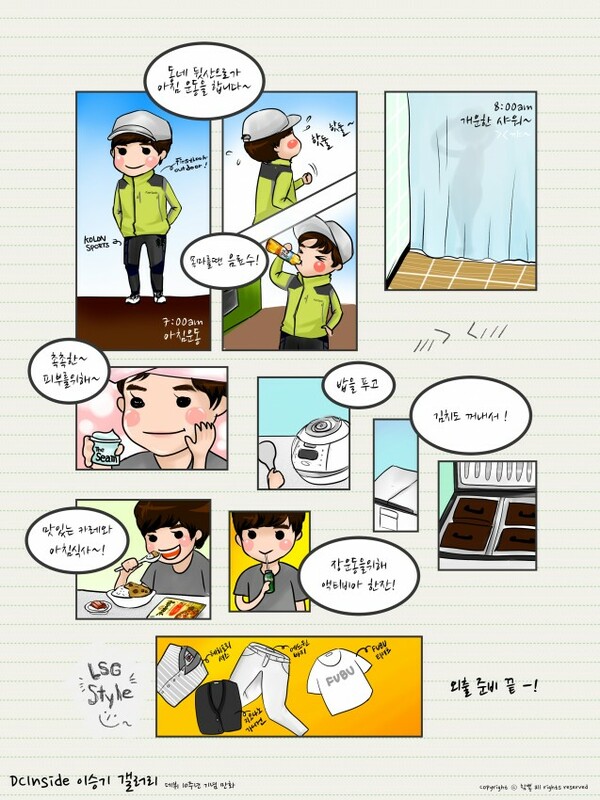 How many CF items endorsed by Seung Gi within the past 10 years can you find? Categories: Anniversary, Berocca, CF, dclsg, Event, Fan Art, Firstlook, Hanwoo, Heritory, KB, Market O, Pizza Hut, translation, WeMAP, You Are All Surrounded | Tags: 10th Debut Anniversary, CJ Mobile, Edwin, Firstlook Outdoor, FUBU, Giordano, Hanwoo, Heritory, Home Plus, Kolon Sports, Market O, Pizza Hut, Sunkist, WeMAP | Permalink. 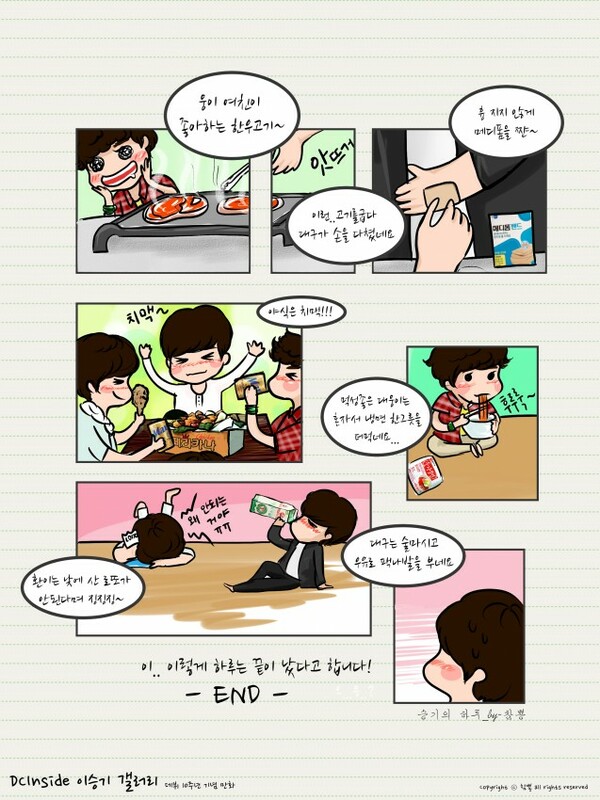 At the very top by Seung Gi’s head: Seung Gi’s Day~ ( followed by ) – Dae Woong’s birthday! Seung Gi in bed as his alarm rings: 6:00am, the start of a new day! Seung Gi pouring water into a glass with orange liquid: A glass of Berocca! Under this box it says: He changes his clothes for his morning exercise. Seung Gi drinks a bottle of something: When thirsty, a beverage! 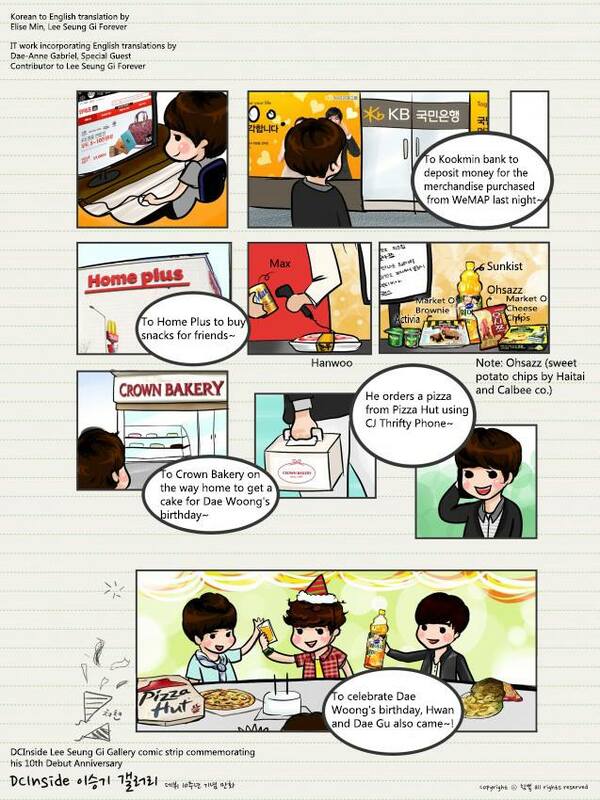 By the kimchi refrigerator with 4 brown compartments: And also takes out the kimchi! Seung Gi eating: A delicious breakfast with curry~! To the right of this box: Preparations to leave the house finished-! Seung Gi with friends: To celebrate Dae Woong’s birthday, Hwan and Dae Gu also came~! Next small box with Korean 앗뜨거: Ouch! It’s hot. Small balloon on the upper right hand corner: A late night snack is chicken and beer!!! Categories: CF, dclsg, Fan Art, Market O, translation | Tags: 10th Debut Anniversary, Activia, Berocca, CF, CF Comic Strip, Chambbong, CJ Mobile, Comic Strip, Cuckoo, dclsg, Edwin, Firstlook Outdoor, FUBU, Giordano, Hanwoo, Heritory, Home Plus, 참뽕, KB bank, Kolon Sports, Market O, Medifoam, Perioe, Pizza Hut, Seung Gi's day, Sunkist, the Seam, translation, WeMAP | Permalink. What to do when you’re craving real cheese chips? 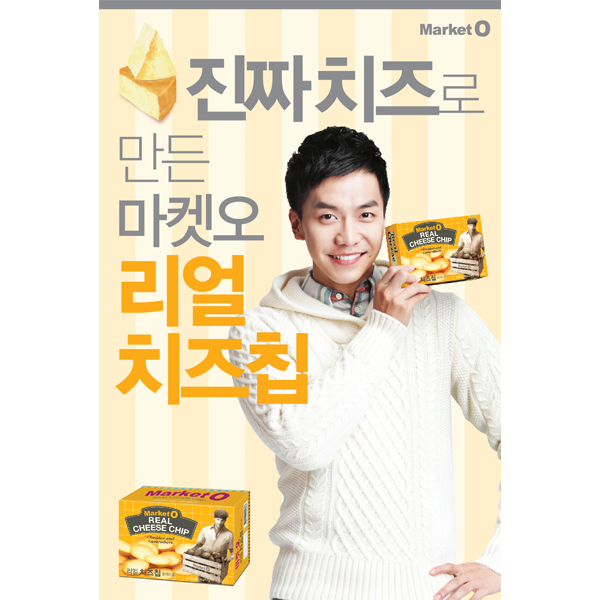 Categories: CF, Market O, Poster, translation | Tags: Lee Seung Gi, Market O, Real Cheese Chip | Permalink. What to do when you’re thinking of the melt in your mouth taste of a real blondie brownie? 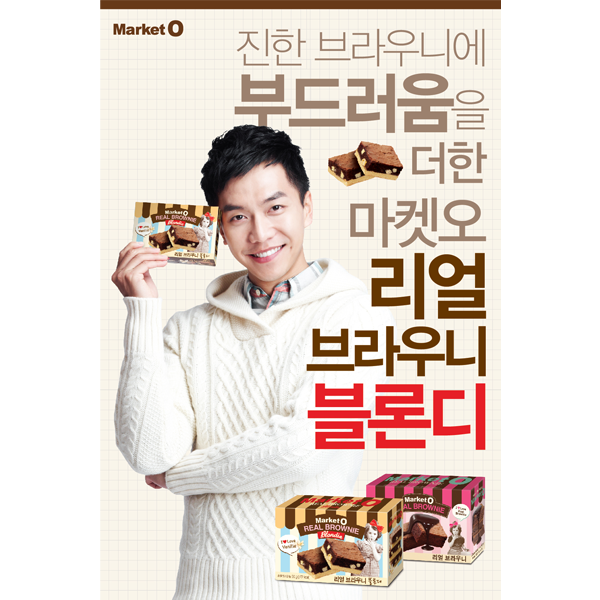 Categories: CF, Market O, Poster, translation | Tags: CF, Lee Seung Gi, MarketO, Real Blondie | Permalink. 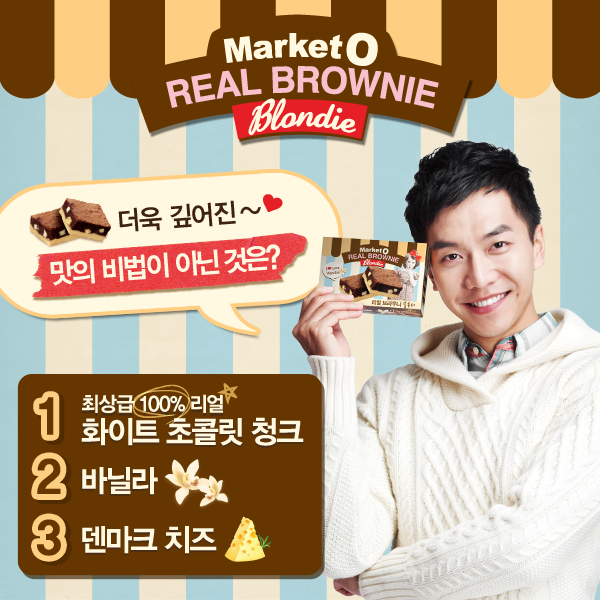 A rich brownie that melts in your mouth, a real brownie Blondie~! What could be the secret behind the even deeper and richer taste?! Categories: Event, Facebook, Market O, translation | Tags: Blondie, event, facebook, Market O, prize, translation | Permalink. Thanks again to sgsairl for subbing and encoding yet another video! Categories: CF, Market O, translation, Video | Tags: CF, Cheese Chip, Market O | Permalink.